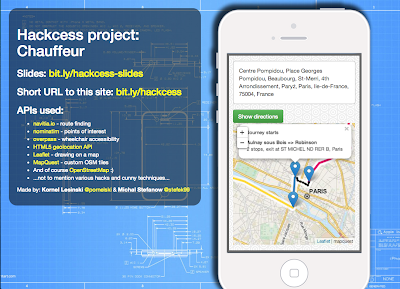 I just came across the project you developed during the Accessibility hackathon and I really like the concept. 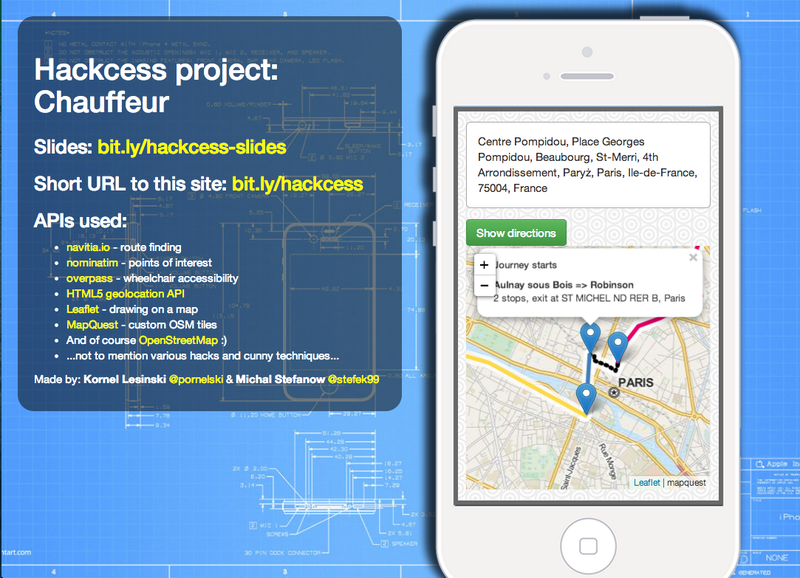 So, I'm more than happy to invite you the week-end of November 15th-17th in Paris where we are organizing Hackcess, a hackathon to solve accessibility and mobility challenges, in partnership with SNCF (French Railway company) and OpenStreetMap. I was greatly honoured that's for sure :) Existential digression - I'm still fairly young - at age of 28 I'm happy that someone pays for my travel (it means that I add value) and I'm still happy to explore. I believe that this an exceptional occasion to network and talk with people I wont meet by staying at home. Organizers were really helpful and we agreed that I come along with team of my choice. You won't image how difficult it was! One person - Bonam - founder of IrisGear.com - was keen to travel with me but as citizen of India it would be difficult to obtain visa (for non-European readers: there is EU, UK and "Schengen" zone). I was really glad @pornelski accepted the offer - he is the expert and I was extremely happy to work with him. So here we are in Paris. Eurostar was fairly expensive. Normally I couldn't afford it or just choose mid-week departure. On this occasion I believe someone made a very good deal by inviting so many smart people under one roof. And yet again I was there - surrounded by people who are just like me. Who come from different locations and speak different languages but have passion for creation. I love taking part in hackathons - where you work ruthlessly or just hang around with extremely smart people. So yes... After 48hrs the projects were finished and from time perspective I would like to share some final thoughts. "autopoi" means point of interest that is autopopulated. It will make more sense if you see the finished app: bit.ly/hackcess - user can select points of interest and then traveling salesman does the rest. 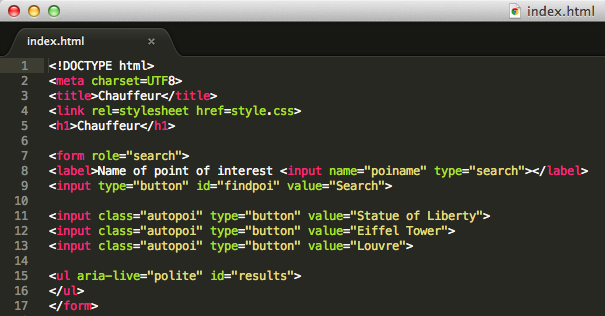 Clean, semantic code. And several APIs all taking to each other. On my part I did some map interactions and used jQuery mobile desktop development template - a tiny project that makes mobile apps more digestible on the larger screen.